adidas' marketing plug: Breathable running shoes with a streamlined design. Upper: Molded neoprene-like mesh, full sleeved design, urethane parts. Midsole: Soft foam core within a firmer, compression molded EVA midsole. Outsole: Carbon rubber from heel to toe. 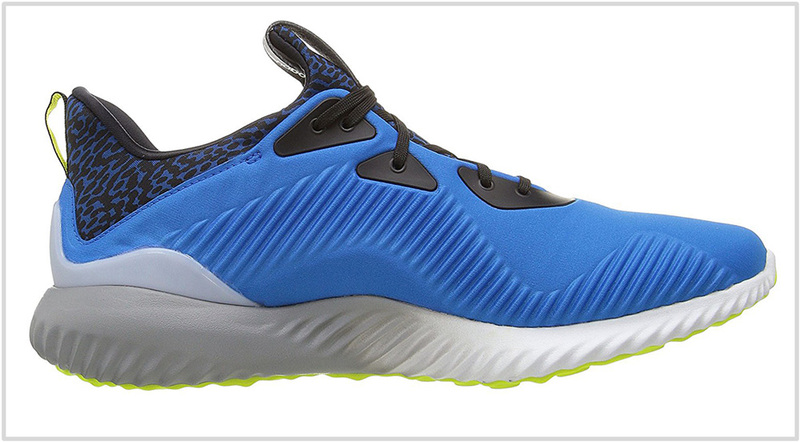 The Alphabounce is a quasi-running shoe with limited athletic potential. As a casual shoe, you'll find little to complain about. The big two brands – adidas and Nike – do a terrible job at separating their pure-play performance running shoes from lifestyle products. Internally, the brands might have an established taxonomy which tells the two apart, but for the regular consumer, the separation is an abstract notion. There are a couple of factors at work here. The first is the whole retro running deal, where the brand ‘re-releases’ a vintage running shoe as a new one, in an attempt to tap into their nostalgic value. Historically, Nike has been very strong in this category, with product-lines such as the Air Max (87, 90, 95, et al.) performing well commercially. Today, if you search nikestore’s catalog, performance and lifestyle shoes are properly categorized, but it wasn’t always that way. There used to be a time when the two were joined at the hip. The second factor causing the category confusion is the rise of the modern ‘active lifestyle’ footwear which has a lot in common with the running silhouette. While Nike has met with recent success in the form of the Roshe Run, adidas is fast turning into the dominant player in this category. Riding on the back of the phenomenally successful Boost platform and the aura of the Yeezy Boost, adidas has released one crossover product after another. The Alphabounce is one of them, which adidas classifies as performance running shoe. The entire cross-over business started with the absolutely horrible Pure Boost ‘running’ shoe. Things wouldn’t have been so bad if adidas had not called it a performance running shoe. But the sorry fact is that they did, and solereview did not have good things to say about it. The entire team of adidas designers and marketeers who worked on the original PB should be banished to Midway Atoll, and collect enough plastic Ocean waste for the next lot of adidas UltraBoost Parleys. Admittedly, the 2016 PureBoost ZG is, functionally speaking, a better product. 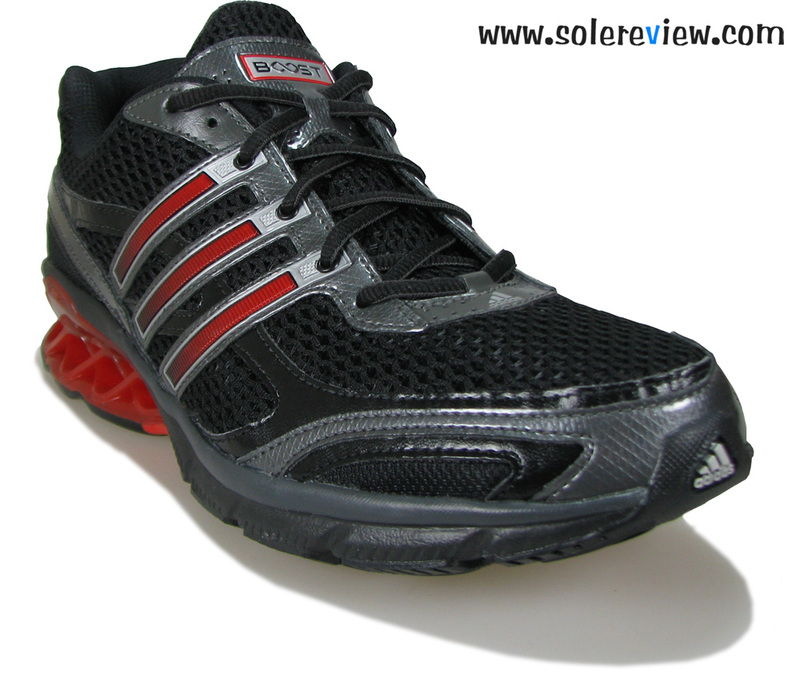 But it remains a crossover shoe which is incapable of taking the abuse which comes with intense athletic activity. With multiple Boost variants, adidas had the higher end of the crossover market nicely stitched up, but they had nothing enticing to offer at the $100 price-band. This is where the Alphabounce comes in. Conceptually, the Alphabounce goes up directly against the similarly priced Nike Roshe Run, a product which once sold with all the frenzy of a Youtube video gone viral. Whereas the Roshe Run adopts a minimal approach to design, the Alphabounce goes for a sharp, yet fluid aesthetic. The midsole is dual density, encasing a soft foam core within a firmer EVA midsole. 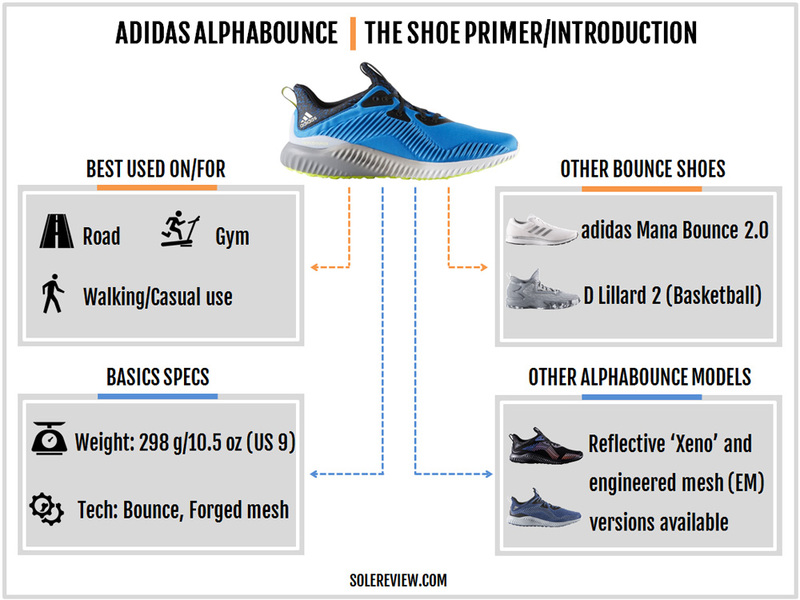 Since its debut a few months ago, the Alphabounce’s rise to the top of the sales chart has been meteoric. It’s easy to (now) see why. The Alphabounce packs in tremendous value for a $100 retail price. The shoe looks expensive for its price, has fashionable aesthetics, and most importantly, it is a well cushioned shoe. These qualities make for an ideal crossover or active lifestyle shoe, which the Alphabounce is. But is it a good shoe from a performance running viewpoint? We say no. Oh, c’mon solereview, one might say. Why can’t you run in the Alphabounce? Haven’t millions of people once run in shoes which are now retro lifestyle sneakers? The Alphabounce is surely better than a retro sneaker performance-wise, no? Besides, is a shoe really that important? Ed Whitlock, an 85-year-old marathoner, ran a sub 4:00 marathon in a pair of 15-year-old Brooks. In other news, a marathoner finished his race in Crocs. And at the height of the ‘barefoot running’ movement, a sizable group of runners were clocking miles in nothing more than a pair of flat rubber sheets mated to a strap made of organic hemp. 1. The core $100 Alphabounce has an unbreathable upper. 2. The sizing is strange; it is a hit or miss kind. 3. The lower count of lacing rows produces an uneven spread of lacing grip. 4. The near-entirety of the cushioning is loaded in the heel. 5. 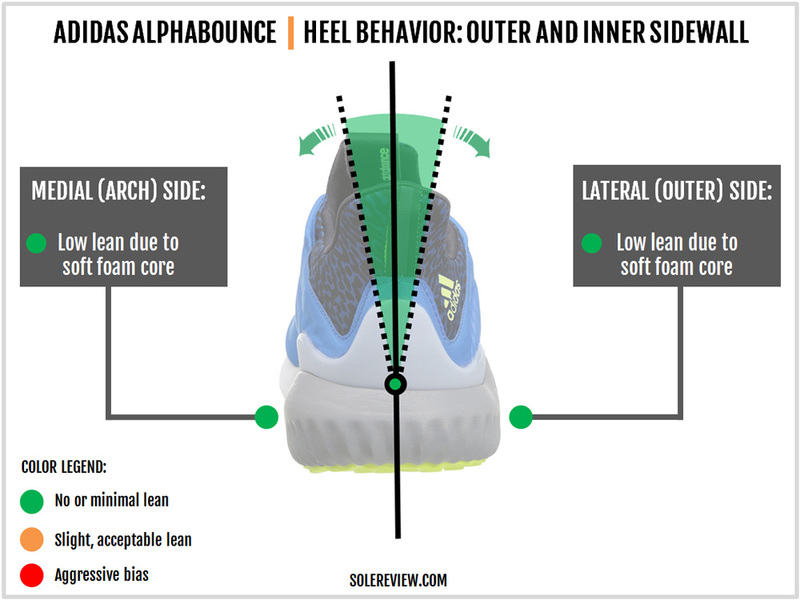 The outsole traction and design are not performance oriented. 6. The heel has a wide opening which results in an average grip. 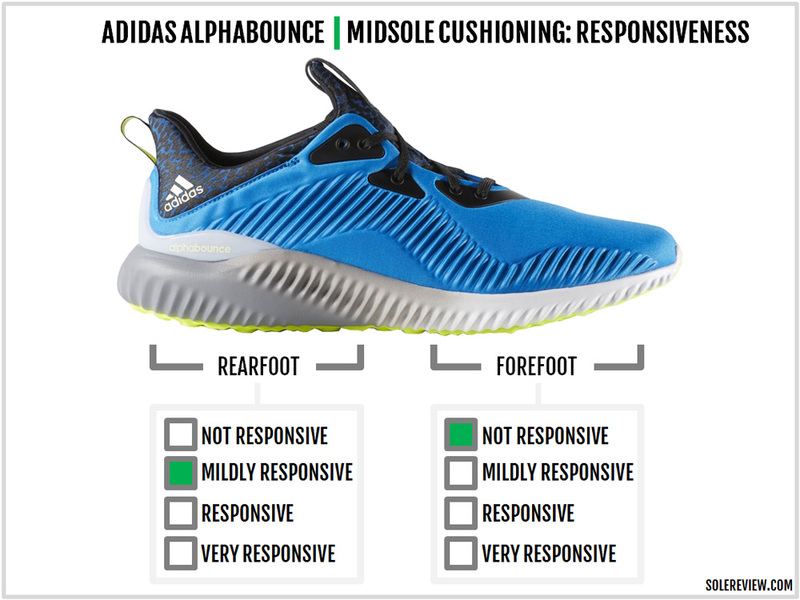 So the ideal use-case for the Alphabounce is that of an everyday lifestyle sneaker, with limited athletic capabilities. Its heel-loaded cushioning makes it a good fit for all day casual use, or for simply walking around. It’ll also do decently if you plan to hit the gym for some weight training, including a mile or so of treadmill warm-up. The Alphabounce’s upper has been designed for ease of use. The construction is a bootie kind, with the tongue integrated into the upper. The heel has a wide opening, a result of the Achilles lip and tongue edge curving upwards. The base mesh (which adidas grandly calls the ‘forged mesh’) resembles a material texture which is somewhere between a Neoprene mesh (Surf suits, kayaking shoes and elsewhere) and polyester double-knit. Smart choice of material, because it has allowed adidas to mold certain parts of the upper to produce aesthetic depth. This would not have been possible by using a regular mesh. On the flip side, the closed nature of the mesh makes the stock Alphabounce a hot and stuffy shoe. There is a minor amount of mesh stretch available, which can account for around 10% of fit adjustment over time. Besides the molding, there’s not much going on the upper. The toe-bumper is internal, hidden under the mesh, and the eyelets are pieces of fused urethane. If one excludes the heel-lock lacing, there are only four lacing rows over the tongue – something which is an affirmative nod to the Alphabounce being a lifestyle shoe. And depending on the Alphabounce color you buy, the upper can be anything from mono-color to an Aramis motion capture inspired print job. In the version pictured here, the rear and sleeved midfoot get a leopard print. 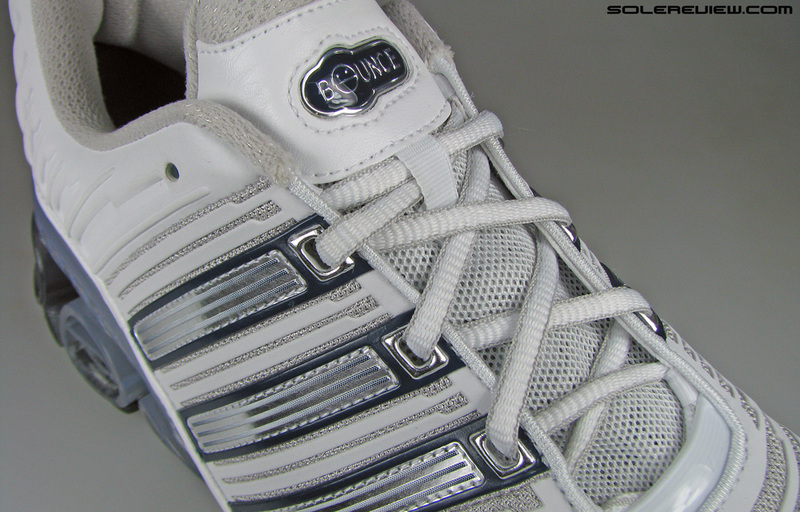 There are a few other areas of detail, like the reflective heel strap and a tongue pull tab. The heel lacks an internal counter and instead is supported by an external clip which partially extends under the foot. For a shoe which is priced at $100, the upper musters a premium look and feel without visual clutter. One of the reasons why many adidas shoes looked a bit stodgy in the past is because the design flow was usually interrupted by the angular three-stripes logo over the midfoot. 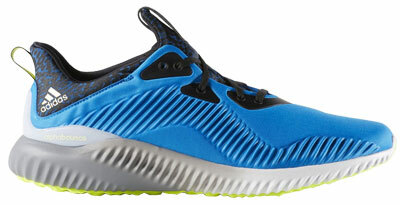 The Alphabounce shrinks the logo and moves it to the heel area, which makes the Alphabounce’s design look fluid. The Alphabounce midsole is an uncomplicated affair. Outside, there’s a firm EVA casing. 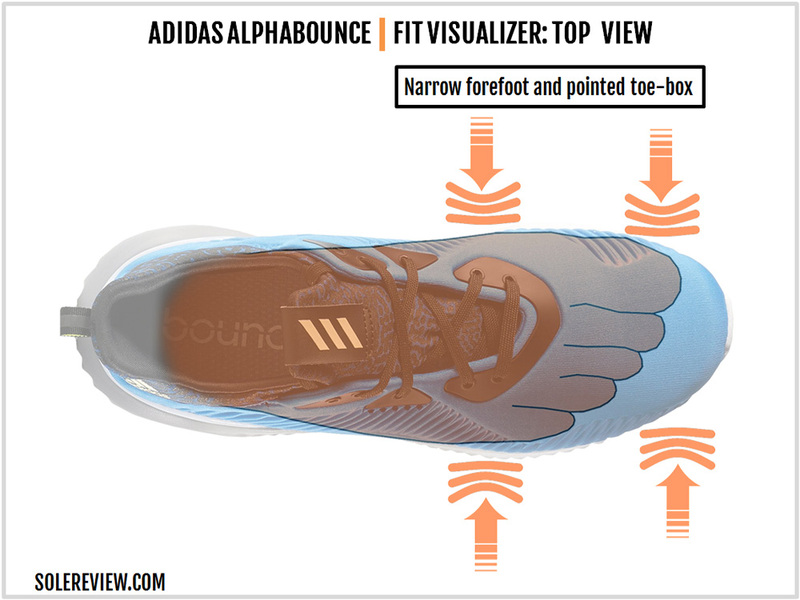 Inside, there’s a soft foam core which adidas calls ‘Bounce.’ Long timers would remember the same name used elsewhere. Many years ago, adidas had a mechanical cushioning shoe concept called the Megabounce, with plastic columns which delivered cushioning by compression and rebound. Even Boost, the name now commonly associated with the miracle foam, was also used to describe a mechanical cushioning platform a few years ago. And why does adidas reuse names? Because it’s very convenient, that’s why. Naming a product remains one of the footwear industry’s most underrated challenges. Naming a shoe isn’t as simple as thinking of a nice name, and then slapping it over the shoe upper and packaging. Usually, a designer or the product manager will think of 50-100 (or more) potential shoe names, and then pass it on to legal for approval, along with intended use. The set of attributes is very similar to that of a trademark submission. Depending on how unique the name is, the final approval could come with a set of restrictions. For example, a name could be ok to use on the shoe and the box, but not ok for marketing. And so forth. Hence, if you already have a ready-made bank of approved shoe names which hasn’t been used in a while, then it makes perfect sense to recycle them. The 2016 Bounce design has nothing in common with the plastic contraption of a few years ago. It just happens to be an EVA foam variant seated inside the firm midsole casing. There aren’t many other shoes using this construction, except for the $80 Mana Bounce 2.0 and the D-Lillard, an entry-level basketball shoe. The way we see it, the Bounce platform is adidas’ economy technology tier, with the higher end being serviced by the Boost midsole. The sidewall texture of the midsole matches the mesh molding. Both the inner and outer midsole have a rib-like molding which serves as aesthetic tie-ins. Part of the midsole is painted too. Much like the upper, the midsole cosmetic will depend on the overall scheme of a particular Alphabounce model. 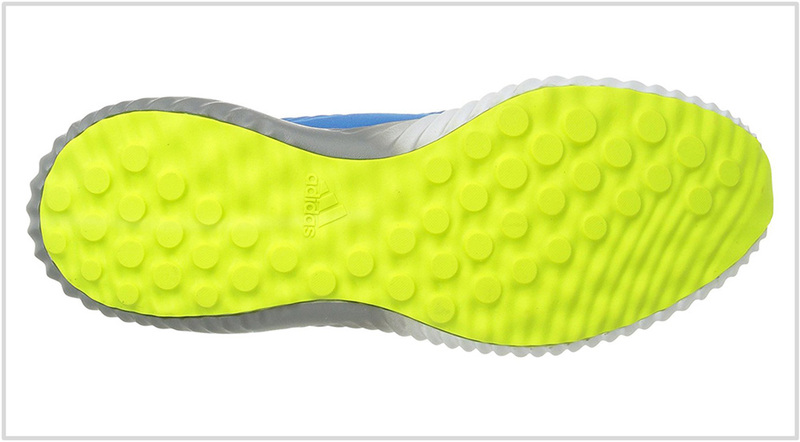 A single-piece rubber outsole covers the bottom. The now ubiquitous flat lugs dot the heel and the forefoot; there’s a small section which has nearly no texture at all. The outsole is regular rubber and not Continental branded in the spirit of the $100 retail price. 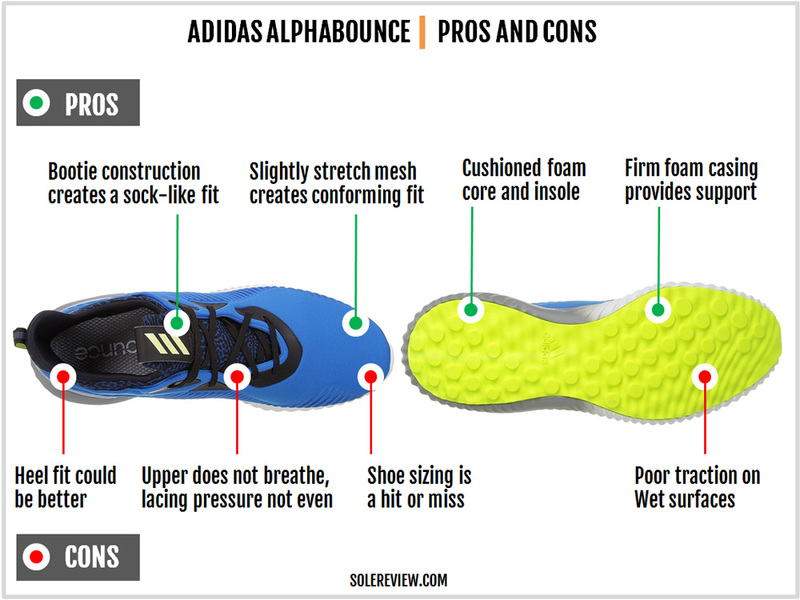 Even with a full rubber outsole and plastic upper bits, the Alphabounce weighs under 11 ounces, which is at par with core performance running shoes. The Alphabounce upper comes pretty layered up, so there isn’t any weak link in the chain. The positive recompense for the lack of ventilation is upper durability, an area where the Alpha should perform well. If anything, the firmer collar edges near the tongue flap might fray after a few hundred miles. The rubber used on the outsole isn’t the Continental kind, so expect slightly lower levels of durability. Also, one might assume that using the AlphaB for non-running activities might prolong its outsole life, but that assumption is misplaced. In fact, walking increases the contact time with the ground. Since the comparison here is between the higher intensity of contact (running) or longer duration (walking), we don’t see any significant lifespan improvement, even if the usage is restricted to casual wear only. The Alphabounce’s toe box fits like the original Ultra Boost – long and shallow. There’s a distinct forward taper of the forefoot which reduces the toe-box height, so expect the neoprene-like mesh to come in contact with your big toe. The midfoot has a decent level of lock-down, thanks to the sock-like upper design. The AlphaB also feels comfortable on the sides, as the upper lacks a cage-like structure used on many performance running adidas models. There are a couple of areas to watch out for, however. The widely spaced out flat lacing tends to apply pressure over the foot when tightly cinched, and the mesh area above the last eyelet is firm and needs breaking in. At the rear, the heel grip is comfortable but not confidence inspiring. The ‘lip’ angles out instead of closing in over the heel, and a similar thing occurs with the upwards pointing tongue. 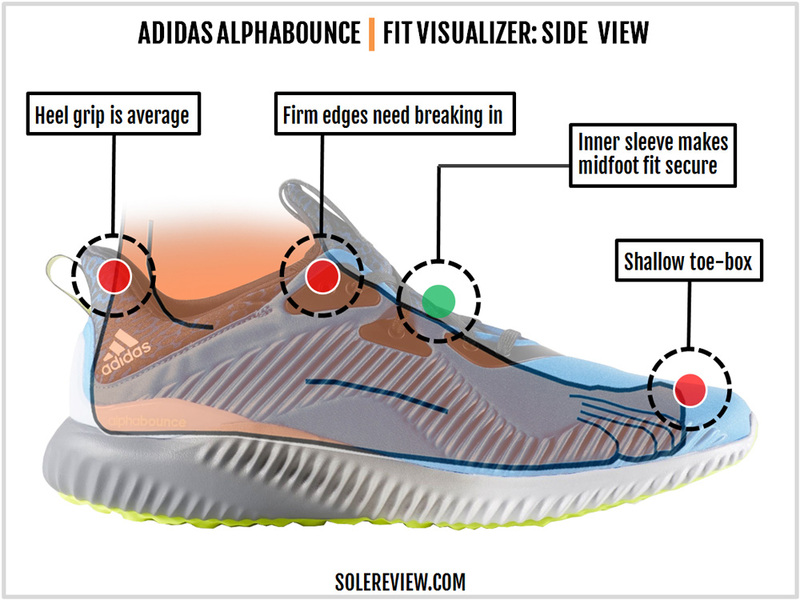 While this design makes the Alphabounce a great shoe to slip in and out of, the heel grip falls short of performance running standards. 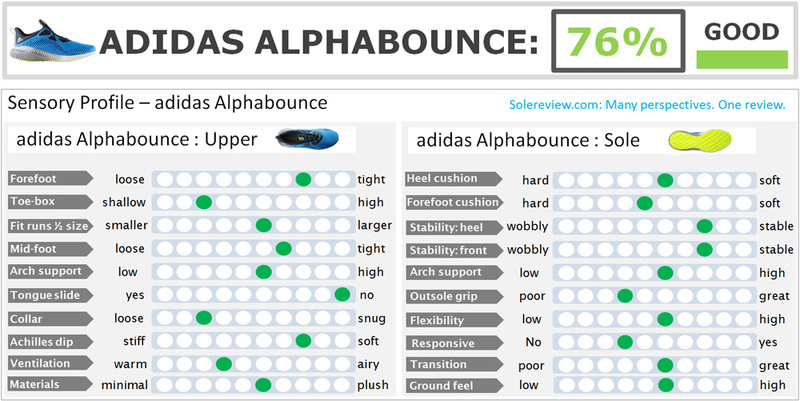 For the lack of a better word, ‘tricky’ is what sums up the Alphabounce sizing. You’ll receive divergent sizing advice depending on who you ask. Hence, the AlphaB’s sizing has to be viewed from three different perspectives – narrow feet, regular feet and wide feet. If you have wide feet (aka 2E), then you’ll need to buy a half size larger. Else, the forefoot will feel too cramped for your liking. But when you go half a size up, there’s excess space ahead of the toes, and the heel loses some of its grip. The forefoot will still feel narrow but is made bearable by smooth interiors and a gradual adjustment to the foot shape over time. A regular foot (D) user can buy true-to-size and will have some space in the front, apart from average heel grip. The forefoot has a slight amount of stretch, so any initial tightness should work itself out over time. 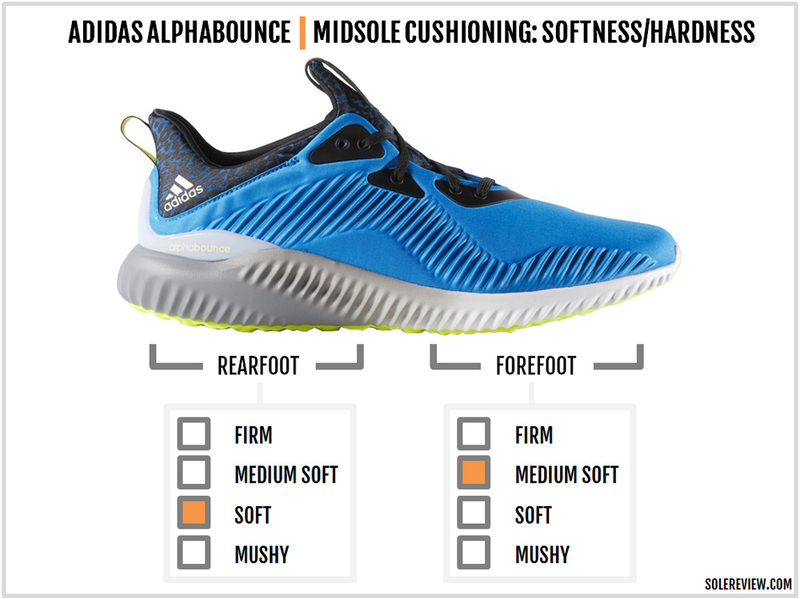 The Alphabounce is perhaps the most suited to the narrow-footed folks. That’s because if you choose to go half a size down, then you can utilize the entire toe-box length, get a comfortable forefoot fit, and optimal heel grip. And how do you know which kind of foot width you have? If you’re regularly buying a 2E version, then it’s a no-brainer. Else, head to the nearest store and have somebody measure the foot width using a Brannock device. A Brannock isn’t perfect but gives a fairly accurate estimate. There’s an abundance of heel loaded cushioning which is typical of lifestyle shoes. This makes the Alphabounce comfortable for all day use. In contrast, the forefoot is much skinnier. Though the cushioned insole also does a pretty good job of providing an immediate softness layer, some might experience soreness under the thin forefoot after a prolonged period of use. It’s important to callout that the Alphabounce’s softness isn’t apparent from the outside. The outer midsole is very firm, but the real action happens when you step on the softer core inside those walls. Though the shoe has the word ‘bounce’ in it, the midsole isn’t very responsive. Is it padded? Yes. Does it produce noticeable rebound? No. An EVA foam is what’s inside the Alpha, so manage your expectations. This isn’t anything like the Boost. As they say – what’s in a name? The midsole design is supportive, helped by the balanced midsole construction and the plastic heel clip. These design elements when combined with the soft core keeps the foot centered. Transitions feel progressive due to the same material used throughout the midsole length. Not sure what the heel offset is, but the tapering is noticeable. Notwithstanding the lack of flex grooves, the forefoot is reasonably flexible due to the thin stack height. There’s a reason why the Alphabounce is a huge commercial success. This isn’t about the shoe’s strikingly good looks alone; if you get the sizing right, the Alpha is a very comfortable shoe. The integrated bootie upper design creates a sock-like fit which feels ultra smooth inside. Underneath, the soft foam center makes walking around a cushioned, yet supportive experience. And the sensible pricing sweetens the deal – there aren’t many $100 retail shoes which look and feel this good. The AlphaB isn’t without its quirks and faults. Depending on your foot shape, the shoe’s sizing is of a hit-or-miss variety. The outsole grip isn’t great, and you especially need to watch out when walking on wet surfaces. On the cosmetic side of things, the midsole paint will chip gradually. Some specimens of the Alphabounce might also show signs of unfinished gluing, and that’s going to be more noticeable in darker colors such as black. The bottomline is that the adidas Alphabounce is a quasi-running shoe with limited athletic capabilities. 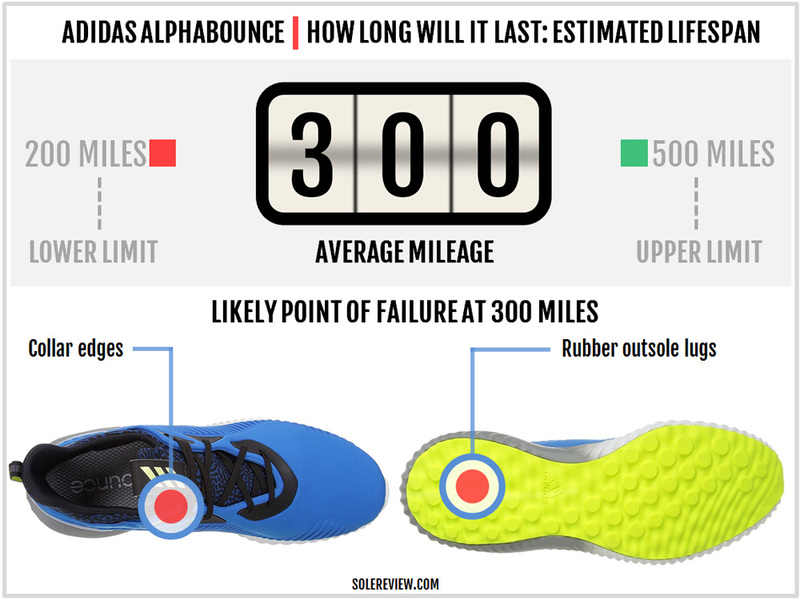 A couple of miles of treadmill running or a gym workout is perfectly fine, but anything beyond that will make you acutely aware of the Alphabounce’s performance limitations.